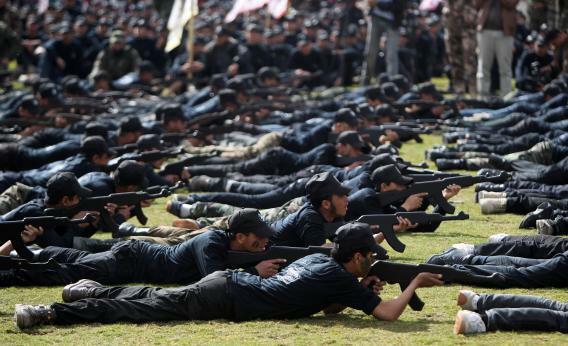 Palestinian high school students show off their skills during a graduation ceremony from a military school course organized by the Hamas security forces and the Hamas Minister of Education on January 24, 2013 in Gaza City. It was a short item, three paragraphs, the third paragraph consisting of White House assistant communications director Eric Schultz blowing off Shapiro. It caught fire on the right in no time. “That is quite the accusation,” wrote Moe Lane at RedState. “All they have to do to debunk it is to have Hagel reveal his foreign donors.” In the National Review, Andrew Stiles reported that “rumors abound on Capitol Hill that a full disclosure of Hagel’s professional ties would reveal financial relationships with a number of ‘unsavory’ groups, including one purportedly called ‘Friends of Hamas.’” Arutz Sheva and Algemeiner, conservative pro-Israel news organizations, ran versions of the story based 100 percent on links to the Shapiro original. On February 7, radio host Hugh Hewitt interviewed Sen. Rand Paul about the Hagel nomination and pushed him on the “Friends of Hamas” story. HH: Let me bring up one piece of information that Ben Shapiro at Breitbart put out today, which is one of the foreign funders behind Senator Hagel that he has not yet disclosed formally is something called Friends Of Hamas. If that is in fact true, Senator, would that lead you to vote against Mr. Hagel? RP: You know, I saw that information today, also, and that is more and more concerning. With each day, there are new things coming out. Paul has since come out against cloture on the nomination. Mike Huckabee, on tour in Israel last week, got asked about “Friends of Hamas” at a press conference. “If it proves true the rumors of Chuck Hagel’s having received funds from Friends of Hamas,” said the 2008 presidential candidate and current Fox News host, “if that’s true then on its face that would disqualify him.” On Fox Business, Lou Dobbs interviewed National Review columnist Andrew McCarthy about the Hagel quandary, and “Friends of Hamas” came up again. DOBBS: That has a ring to it, doesn’t it? Here’s the problem: There’s no proof that “Friends of Hamas” actually exists. At best, it’s an organization so secret that nobody in government has thought to mention its existence. At worst, it’s as fake as Manti Te’o’s girlfriend. The Treasury Department, which designates sponsors of terror, has done so to many charities tied to Hamas. “Friends of Hamas” is not among them. The State Department doesn’t designate it, either. And a bit less holistically, a Lexis search for the group reveals absolutely nothing. At this writing and absent the requested disclosure, it cannot be determined whether Mr. Hagel is literally associated with the “friends” of a designated terrorist organization. The mere fact, though, that it seems entirely plausible — given the nominee’s record of hostility toward Israel and his affinity for its enemies (including Hamas’ longtime sponsor, Iran) — his refusal to make the sort of disclosure expected of all Cabinet appointees should be the last straw for Senate Republicans and Democrats alike. “The original story is the entirety of the information I have,” he said.